Approximately once per month the Railroad Commission of Texas (RRC) publishes a report covering the number of wells drilled in Eagle Ford. The January report states that 10,140 wells for oil production had been drilled by 1 January 2016. The number of gas wells was just under 5,000 so the total wells now drilled in Eagle Ford is over 15,000. In October 2013 I arrived at the University of Texas in Austin to study oil and gas production by fracking. Now, when I added the latest statistics from the RRC to my database, I decided to draw a diagram of drilling activity in Eagle Ford during the latest 3 years. By 7 January 2013 a total of 2,508 oil wells and 929 gas wells had been drilled. When I arrived in Texas on 1 October 2013 the number of oil wells had increased to 4,476 and there were 2,193 gas wells. One can be amazed by the number of wells drilled but if one looks at the number of drilling rigs involved there were around 225 with more and more of these swapping over to oil drilling from gas drilling. In the summer of 2013 there were around 200 rigs drilling for oil with 25 drilling for gas. Every oil rig drilled one well per month while the gas rigs drilled several per month. In the figure above I had summarized the number of reported drilled wells per quarter year in Eagle Ford. There is a relatively even spread from quarter to quarter. The wells that were being drilled when I visited Eagle Ford from the end of 2013 to the start of 2014 are first included in the RRC report that covers the first quarter of 2014. 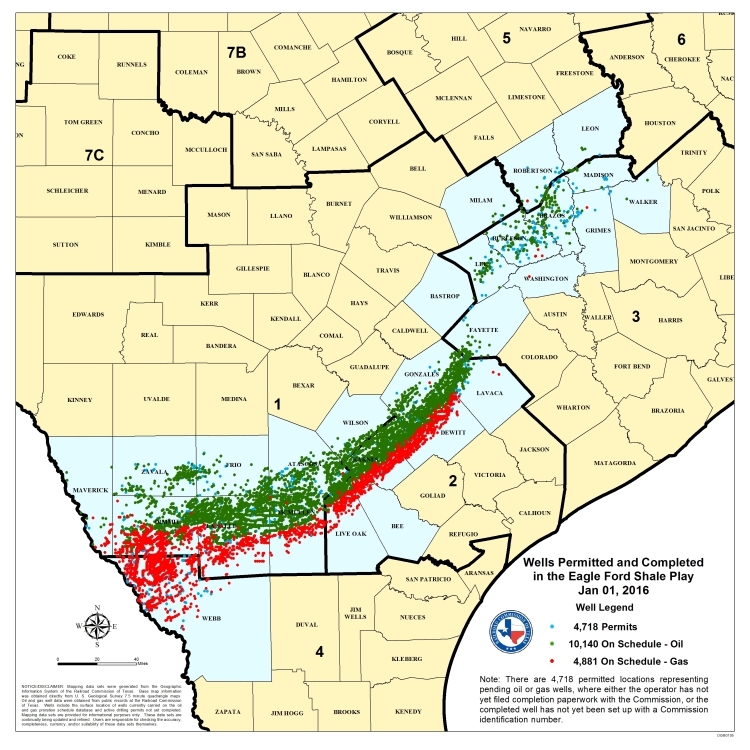 That was the time of greatest drilling activity in Eagle Ford. The decline in wells drilled during the first quarter of 2015 was expected since the number of drilling rigs decreased markedly. What surprised me greatly is that, during 2015, while drilling rigs were decreasing the number of wells drilled per quarter increased. So I decided to put the well number data together with the rig number data to see the wells drilled per rig. In the figure above we can see that up until the first quarter of 2015 there was approximately one well per rig but then something dramatic happened. The number of wells drilled per rig per quarter increased. The low oil price forced efficiency gains on the industry so that multi-well pad drilling was developed. For more information on the technique I refer you to an article at Drilling Info (The Next Evolutionary Step in Pad Drilling). What does it mean that the number of wells drilled in Eagle Ford has not decreased while production is decreasing. We can conclude that the oil companies are drilling wells but waiting until the oil price goes up before they frack them. There are now several thousand wells in Eagle Ford waiting for fracking or completion. Boom towns such as Three Rivers are quite quiet at the moment but when the price of oil rises they will fill once again with fracking teams and drivers that will drive thousands of trucks carrying the supplies required for fracking.